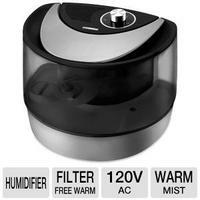 CompUSA via Tigerdirect offers Bionaire BWM2601U Humidifier for $19.99 + $7 shipping. CompUSA 2012 Black Friday Ad/Flyer released . CompUSA offers the Kingston 8GB HyperX PC3-12800 DDR3-1600 240-Pin Desktop Memory Kit with two 4GB DIMMs, model: KHX1600C9D3K2/8GX, for $14.99 with $2.29 for shipping. 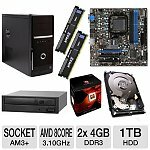 Comp USA offers AMD Desktop Barebones Kit: FX-8120 8-Core AM3+ CPU, MSI 760GM-E51 Motherboard for $424.99 - $75 in rebates (linked below) = $350. Shipping is $11. CompUSA offers the Kodak Zx1 720p Pocket Secure Digital Card HD Digital Camcorder in Yellow, model: 8934150, for $39.99 with free shipping. Features/Specifications: 720p HD video recording, 2" LCD, SDHC card slot, and more. CompUSA offers the Intel Core i5 Ivy Bridge 3.8GHz Quad-Core Barebones Desktop PC Kit for $589.99. Mail-in rebates of $20, $20, $20, $20, and $10 drop it to $499.99 with free shipping. Features/Specifications: the GIGABYTE GA-Z77-DS3H Intel 7 Series ATX motherboard, Intel Core i5-3570K 3.8GHz Ivy Bridge quad-core processor, two ADATA Premier Series 4GB PC3-10666 DDR3-1333MHz desktop RAM (8GB total), Seagate Barracuda 1TB hard drive, Sony Optiarc 24x SATA DVD burner, Thermaltake Commander MS-I Snow Edition Tower Case, and Ultra LSP650 650-watt ATX power supply. CompUSA has the Acer Aspire AS5750G-9821 Intel Core i7-2670QM Quad-Core Sandy Bridge 15.6" Notebook Computer w/ Dedicated Graphics for $699.97. $8.47 Shipping. CompUSA offers the Logitech Ultimate Ears 100 Noise-Isolating Earphones in Red/Blue (pictured), model: 985-000189, Blue, model: 985-000149, or Green/Black, model: 985-000185, for $5.99 with $6.29 for shipping. They include four sizes of ear cushions and block outside noise up to 24dB. For in-store pickup only, CompUSA offers the 5.74-lb. Acer AS5750-6438 Intel Core i5 2.4GHz 15.6" LED-Backlit Widescreen LCD Notebook in Black, model: LX.RLY02.177, for $399.99. Features/Specifications: an Intel Core i5-2430M 2.4GHz dual-core "Sandy Bridge" processor, 15.6" 1366x768 LED-backlit widescreen LCD, 4GB RAM, 500GB hard drive, dual layer DVD burner, media card reader, 802.11n wireless, Gigabit Ethernet, HD webcam, microphone, 6-cell battery, and Windows 7 Home Premium 64-bit. Today only (Oct 28), CompUSA takes up to 60% off select HD televisions, computers, printers, and more during its "Black Friday" Sale. CompUSA offers the 5.97-lb. Sony VAIO E Series Intel Core i3 2.1GHz 15.5" LED-Backlit Widescreen Notebook in Charcoal Black, model: VPCEH13FX/B, for $549.99 with $9.13 for shipping. Features/Specifications: an Intel Core i3-2310M 2.1GHz dual-core processor, 15.5" 1366x768 LED-backlit widescreen LCD, 4GB RAM, 640GB 5400 rpm hard drive, DVD burner, 802.1n wireless, and Windows 7 Home Premium 64-bit.